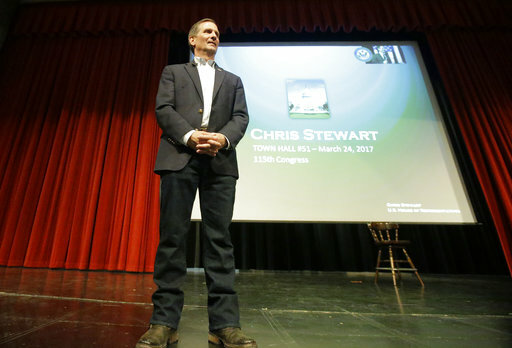 SALT LAKE CITY — A crowd of more than 1,000 people in Utah’s Democratic stronghold booed Republican U.S. Rep. Chris Stewart at a Friday night town hall as the congressman defended GOP positions on health care, public lands and immigration. Audience members yelled, “Do your job,” imploring him to investigate and denounce connections between President Donald Trump’s campaign and Russia and to hold the new administration accountable. Stewart started the event at a high school in Salt Lake City by acknowledging that many in the crowd likely didn’t vote for him, but he said he thinks it’s still important to hear them — one of the few comments he made that received applause. 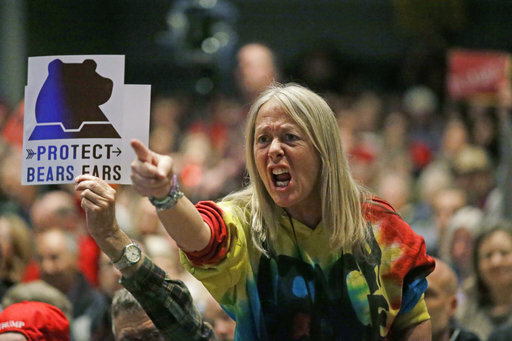 The event marked the first town hall by a member of the state’s all-Republican congressional delegation since Rep. Jason Chaffetz was shouted down by a cacophony of boos at a February town hall. Chaffetz later claimed that some of those in attendance were paid protesters. Before Stewart’s event started Friday night, Democratic state Sen. Jim Dabakis of Salt Lake City said he wanted to ensure attendees were also “paid,” and he handed out Russian rubles to dozens of people waiting in line to enter. While many in the crowd were angered by Stewart’s answers, including his defense of Trump’s proposed border wall with Mexico, shouting and boos did not reach the same level of discord that Chaffetz faced. Audience members held signs that read “agree” and “disagree,” to show how they felt about audience questions and the congressman’s responses. Many in the crowd stood and shouted, at times making it difficult to hear part of Stewart’s comments. Some of the loudest objections came in response to questions about the president and Russia. Laura Wolf of Salt Lake City asked Stewart, who serves on the U.S. House Intelligence Committee, whether he was concerned about Russian interference in the U.S. election and Trump’s possible ties, or whether he was just concerned about leaks of classified information. “I’m equally concerned about both and we want to find out the answer to both,” he said. Stewart, who has been in office since early 2013, has been criticized by some Utah voters for his support of Trump in the election and Republican plans to repeal and replace President Barack Obama’s health care law. Just before the election last November, Stewart said he would vote for Trump, despite having denounced him for comments in a 2005 Access Hollywood tape in which the president bragged about groping women. Stewart said last year that he was supporting Trump in order to prevent Democrat Hillary Clinton from winning, particularly because he was concerned about the next president filling vacancies on the U.S. Supreme Court. Stewart, who was re-elected to a third term in November with about 62 percent of the vote, represents Utah’s 2nd Congressional District. It’s the state’s largest congressional seat, covering Salt Lake City, some of its northern suburbs and a vast chunk of the state’s eastern and southern rural areas. Friday night’s event was his 51st town hall, including five telephone town halls, according to his office. It was originally scheduled last week, but the congressman postponed the event to stay in Washington for a planned vote on the health bill. Written by MICHELLE L. PRICE, Associated Press. Associated Press writer Hallie Golden contributed to this story. While I’m no fan of Representative Stewart, the lesson I see is that level headed opposition to what’s going on in DC must fill the hall before democratic progressive liberal enthusiasts take most of the seats so they can shout down any and all who disagree what so ever. It should be possible to have informed discussions (unless Rep Stewart uses 1/3 of the time allowed to remind everyone of his military past — again). I hope Representative Stewart will come to St George at a location where those who want to attend, may. Perhaps we can review his voting record and key issues coming up. Now I know we aren’t the party leaders so he might not really listen, but I can still dream. Let’s start with RyanCare and where in the Constitution he finds that as a federal responsibility. Soros stooges, paid to shriek, and to be civil. The more they do this around the country, the better the mid-terms will favor Republicans. Exactly what I was thinking Wilbur! I wonder how much they got paid this time to be unruly. Nope, not all of us want the primary concern of utah politicians to be doing special favors for the drilling and mining industries. They are actually supposed to represent citizens and not extraction interests. The day will come. But that would probly come as news to them. no one is being paid to disrupt these meetings. that notion has been thoroughly debunked. not one attendee at any town hall meeting has been identified as a non-constituent. simpletons like you are easy to fool with misinformation. Please show me proof where it has been debunked. 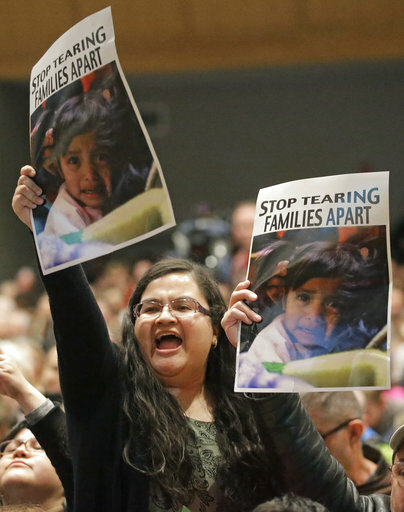 Last I saw, there was proof- CL jobs to cause riots and photos of buses close by bringing these people in to cause chaos where ever Trump spoke. People are catching on to how greedy and self-serving these utah mormon-republicans are. Someday enough Utah votors may grow a brain and throw them the heck out. It would be about time. Exactly what is being done that needs catching on to? I love how you guys like to take cheep shots without really making a coherent argument about a real problem. It seems to me that you are the one who is self serving. These state congressman and representatives work hard for us. You may not like every decision they make but they are hardly self serving. I don’t see how any of what went on at this town hall meeting was greedy or self serving on the part of Mr Stewart. In fact he has spend his life giving service to this country/state and has earned the the right to be treated with respect. You liberals prove more and more day by day that you have no clue what that’s like anymore. Why exactly does the fact that he is a Mormon cause you so much grief? Or is that just your progressive, liberal, discriminatory, two faced bigotry showing again.